whew! We made it. We survived December and now we are snugly in the middle of January. The holidays are behind us and we have lived to tell the tale. The weeks before Christmas are so busy. On top of all the schoolwork, housework, and work work there is now, heaped up, Christmas parties and pageants, cookie exchanges to bake for and attend, shopping and wrapping, decorating and tree trimming. I could go on but you already know. The Christmas candle lit on our Advent wreath. Online and in real life I've seen people add even more activities to their December days by keeping an Advent calendar. Two years ago my mom even bought one for us. A pretty banner, threaded on red ribbon. The banner is made up of envelopes, numbered 1-25 and in each one we slide a special activity to do on that day. - I didn't hate Christmas music by December 24th. - I wasn't sick of my Christmas tree and feeling claustrophobic because of it by December 26th. - I experienced Advent the way the Church intends us to: as a season of preparation for the coming of Christ. I had time to pray and focus on building up virtue. I had time to go to confession. I had time to focus on my spending so I had extra left to give. In short, I had time to prepare for the Bridegroom. But when Christmas came it just kind of floated by. This year I wanted to change that and I realized the easiest way was to add my mom's gift back into our celebrations but this time to use it as a way to celebrate the Twelve Days of Christmas. Quick break for a disclaimer: None of this is to say that how my family celebrates Advent and Christmas is the one, true Catholic way. Of course not! But it is the way that fits my personality and our family in this season of life and I'm so grateful that I learned that. I'm sharing this because it's fun and maybe you're trying to figure this all out too and this may be helpful. :End disclaimer. The Catholic Church intensely celebrates Christmas for twelve days beginning on Christmas Day. I decided to take a lot of those Advent calendar ideas - some of which are just winter fun and some of which are actually pretty Christmas-y - and use them to give purpose and celebration to each of our twelve days. Since Advent is so busy and the days after Christmas are so slow - especially since my husband is also a school teacher and the whole family is home all day for two weeks - this worked incredibly well. On the first day of Christmas (the 25th) we watched a special Christmas movie (The Charlie Brown Christmas Special). On the second day of Christmas (the 26th) the kids made special Christmas cards for some friends. On the third day of Christmas (the 27th) we made snowflakes. The older kids were able to fold and cut their own snowflakes but for the younger kids I folded the paper and then gave it back to them. They then drew / scribbled a design on the triangle and gave it back to me. I cut out their snowflake based on how the lines they made. They were incredibly proud of their snowflakes. On the fourth day of Christmas (the 28th) we went to a local Christmas light display. On the fifth day of Christmas (the 29th) we sang Christmas carols. On the sixth day of Christmas (the 30th) we celebrated our wedding anniversary with a date night. On the seventh day of Christmas (the 31st) we baked Christmas cookies. On the eighth day of Christmas (Janueary 1st) we celebrated the Solemnity of Mary, the Mother of God by attending Mass. On the ninth day of Christmas (the 2nd) we had a fire in the fireplace and drank hot chocolate. On the tenth day of Christmas (the 3rd) we had an Epiphany party. (Okay, actually we had to cancel the party because my daughter became sick, but this is what we would have done...) There were snacks and treat, juice boxes for the kids and cocktails for the parents. At a certain point in the evening we would have had the kids gather and three of them would have been selected to carry the Magi to the stable while we sang "We Three Kings". On the eleventh day of Christmas (the 4th) we wrote a letter to a missionary. On the twelfth day of Christmas (the 5th) we read stories from our Christmas book basket. On Epiphany - which is January 6th and the feast of the Wise Men visiting the baby Jesus - the kids got their last little gift of the season. And that was that. 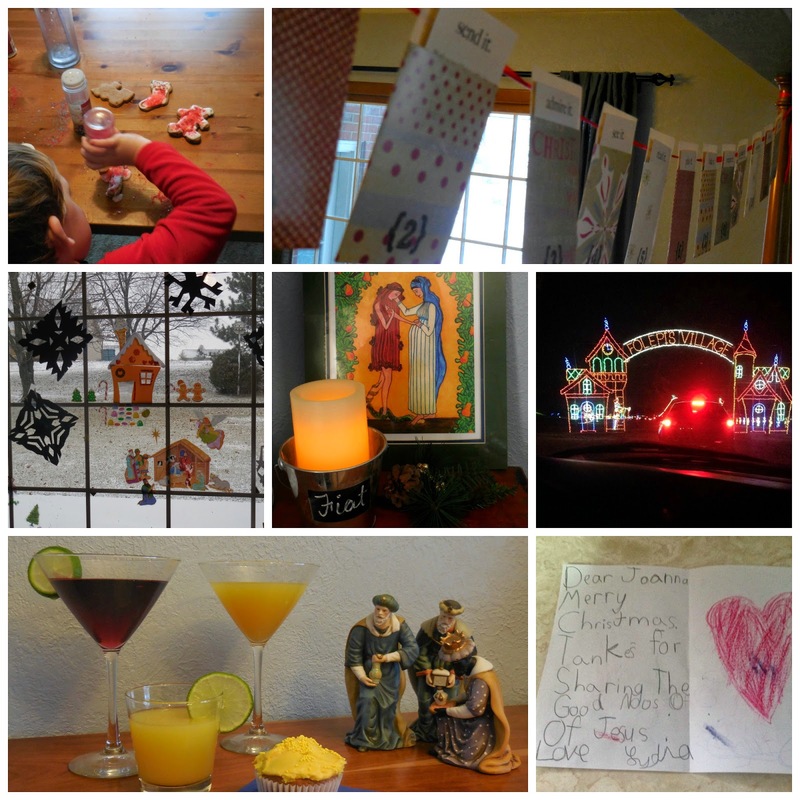 Christmas felt sufficiently - but not overwhelmingly - celebrated. The kids were excited to see what each day brought and we enjoyed a lot of simple family time. I'm looking for more ideas, too. If you've got any or any special traditions from your family's celebration of Christmas, please let me know! What a fun way to do this! I used to do the daily activity calendar during Advent, and this year I just couldn't do it. But doing after Christmas would be lovely. I'm going to do this next year! I love this idea! Thank you for the disclaimer, Bonnie. It is wonderful how big our Church is, how She embraces all people, all personalities, all walks of life. Your disclaimer reminded me of that. This is great Bonnie! I made an effort to not listen to Christmas music during Advent and I was SO surprised how that one small action helped me better prepare and enter into Advent. December 30th is our wedding anniversary as well! Unfortunatley however, we didn't get a date night. Sounds so sweet and simple. Thank you for the nice ideas. I am a newer Catholic, so keeping Advent and 12 days of Christmas AFTER Dec 25 is a whole new thing for me. These are great ideas Bonnie! 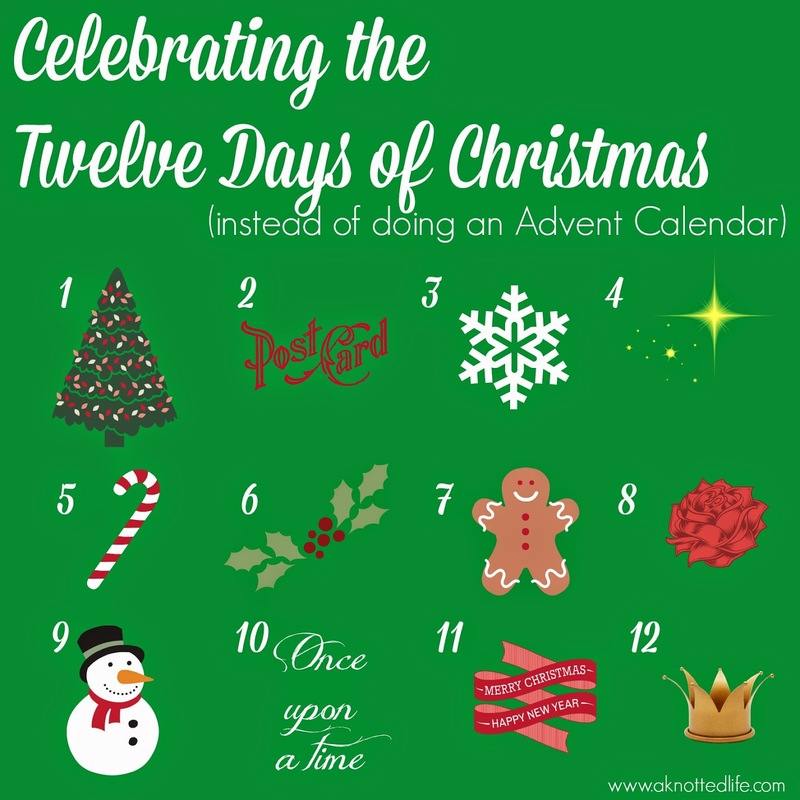 I bought a book on celebrating the 12 days of Christmas and it includes activities to do each day, but I was so overwhelmed that we didn't do anything. Next year, I'm taking your direction and waiting during Advent.